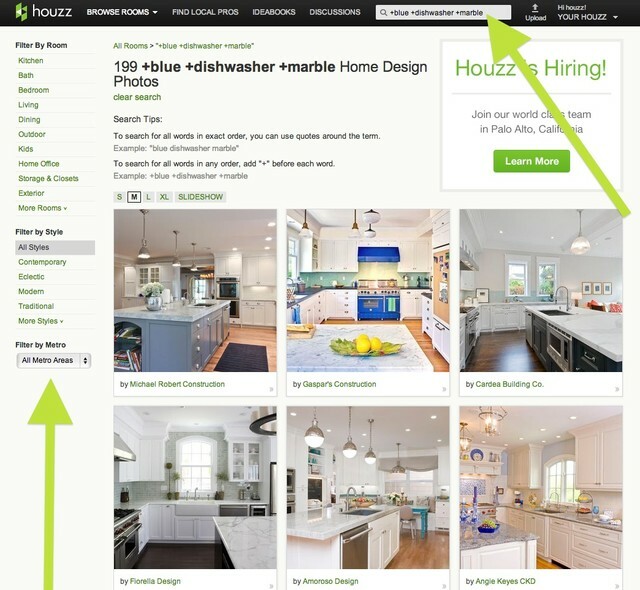 Whether you love browsing photos, searching for a contractor, chatting in Discussions, reading featured ideabooks or all of the above, the Houzz team is always working to make your experience better. Whether you're a new Houzzer or the one who shows everyone else all the tricks, there's probably a tip in here to expand your experience, from power searches and finding photos recommended for you to viewing Houzz on your big-screen TV. 1. Use quotation marks to do searches for terms with two or more words. If you're looking for something specific that's more than one word, try searching for the entire term in quotes. That will exclude any photos that feature just one of your search terms (or both terms in a different order). 2. Search with "+". Searching for photos with multiple features? Put the plus sign before all the words in your search to find photos containing all of those things. 3. Refine your search results. Once you've hit the Search button while doing a photo search, try clicking on one of the room links (kitchen, bath, bedroom etc.) in the left-hand column on the results page. You can narrow down your results by room, style and location. Want to go back? Follow the links at the top of the page to take a step back in the room, style and location filters. 4. Find related guides and articles. Green links at the top of each featured ideabook lead to related tips and guides. 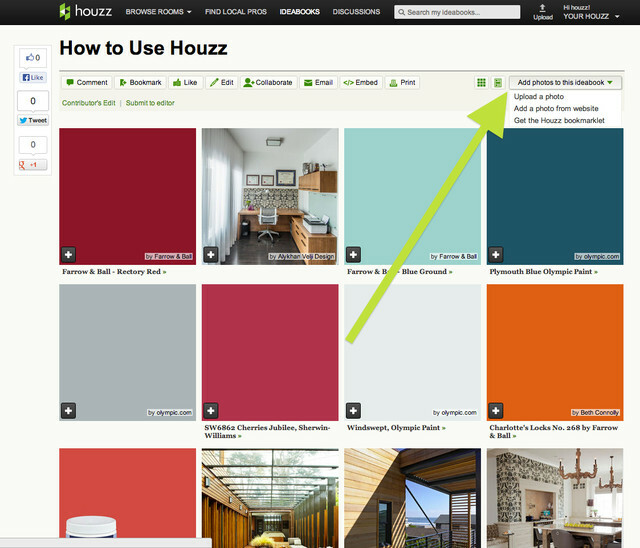 Hover your mouse over the links to see recent featured ideabooks in each category, written by Houzz editors, design writers, architects, designers and contractors. You can also use the Search bar to find helpful ideabooks and guides on your favorite topic. Just type in your search terms and select Ideabooks from the menu. 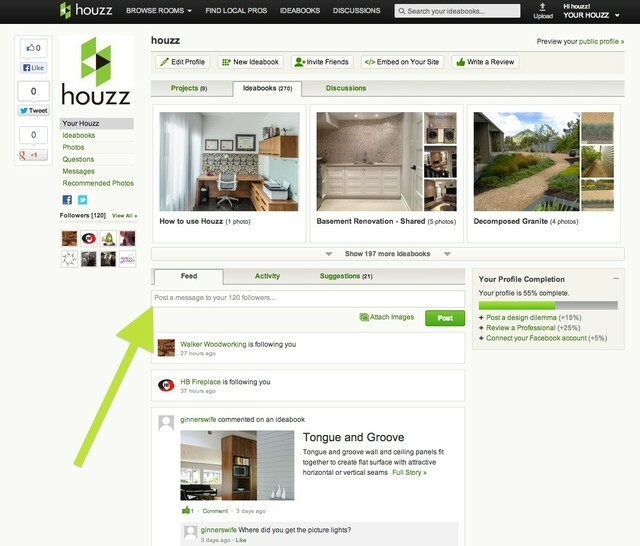 You can also browse the archive by clicking "Ideabooks" at the top of any page on Houzz. When you get to the next page, browse through the links on the left side to explore thousands of decorating and remodeling guides, plus a few surprises. 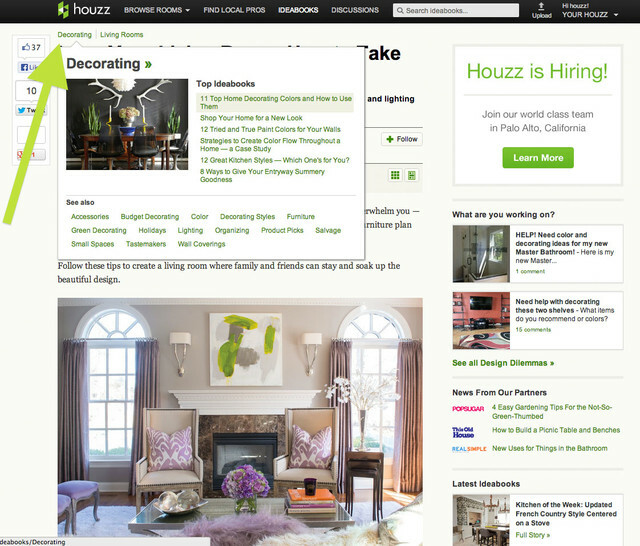 Be sure to check out the Life and Fun Houzz sections. 5. Recommended photos and followers. 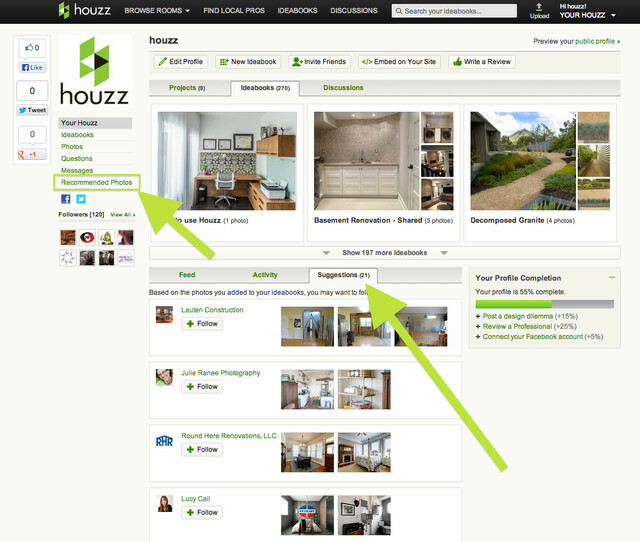 Check out the Recommended Photos section under Your Houzz for photos based on your current favorites. The Suggestions tab on your feed will provide you with plenty of new professionals to follow, based on your style. 6. Post a photo or comment to your followers. Ask for your followers' advice on a design dilemma, or let everyone know what project you worked on this weekend. Posting a photo or comment on your feed will make it visible to your fans. 7. Add photos directly from websites to your ideabooks. Compile all of your inspiring images in one place. 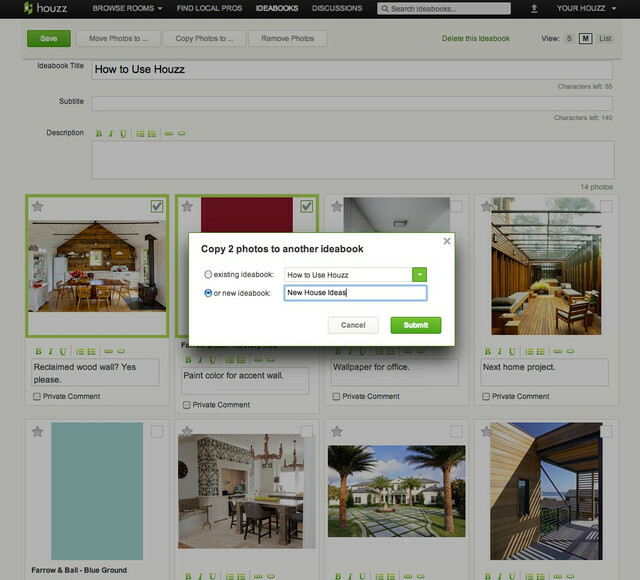 Use the Houzz Bookmarklet or the "Add a photo from website" option in the "Add photos to this ideabook" drop-down menu in the top-right corner of your ideabook. 8. Copy photos and comments into another ideabook. Organize your favorite photos and divvy up your images into different ideabooks. Copy photos and text from one ideabook into another with the "Copy Photos to ..." button while you're in ideabook Edit mode. Just select the photos you want to move, hit "Copy Photos to ... " and find the ideabook you want to add it to or create an entirely new ideabook. To move photos and text completely out of an ideabook, hit "Move Photos to ..."
Connect with a cable: Plug a digital A/V adapter into your iPad and then plug an HDMI cable into the smaller of the two slots. Insert the other end of the HDMI cable into an HDMI port on your television. Switch your TV's input to HDMI and turn on the Houzz app. Connect wirelessly: Double tap the home button on your iPad to show the multitask bar. Slide it all the way to the left to see the sound controls and an Airplay button. Tap the Airplay button, select your Apple TV and choose "Mirroring on." 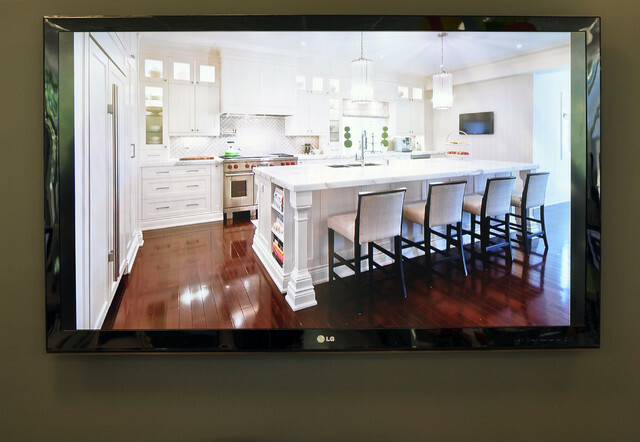 Launch the Houzz app on your iPad, and it should detect that your Apple TV is connected and display images on your TV screen.